Prog is a retired Melee commentator from Westbury, New York who is currently residing in Plano, Texas, a co-host of the Melee It On Me podcast, and is widely considered to be the "Ambassador of Smash", representing the community in interviews, outreach, and interface with the Fighting Game Community at large. Originally from Westbury, NY, he got his first taste of the competitive scene in Philadelphia, Pennsylvania. A former competitor and uploader, he now focuses on commentary and production duties for the Melee community. He served as the primary commentator for the Melee tournament at EVO 2013. With streaming becoming more prominent, he is focused on creating videos to educate new people to the scene and those who may be starting at their very first matches in the competitive scene as well as promotional videos. Prog is introduced in the Smash Bros. Invitational rules video. 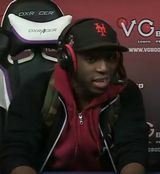 In 2014, Prog, along with Scar and D1, was selected by Nintendo to be a commentator at the Super Smash Bros. Invitational event. Their participation was revealed in the form of Smash 4 newcomer-style images. After commentating on the livestream of MLG Anaheim 2014, Prog announced that, due to health issues, he would no longer commentate on the livestreams of Smash tournaments after EVO 2014. Despite this, he appeared as a commentator for Apex 2015, Pound 2016, and Smash Rivalries. "Prog" appears as a random name option in Super Smash Bros. for Wii U.
Prog is also a top Street Fighter V player, in which he plays FANG. This page was last edited on September 30, 2018, at 00:48.